We’re pleased that Chris Van Hollen has maintained his lead, despite the million dollar blitz of Super PAC advertising. We’re confident that voters are looking for his effective, progressive leadership that gets things done for Maryland families. Early this morning, a new Senate race poll from Patrick Gonzales was released showing Chris Van Hollen leading Donna Edwards 38-36 in the Democratic primary to replace Barbara Mikulski. The results are part of a larger poll of all Maryland voters, the poll also showing that Governor Larry Hogan enjoys a 67% job approval rating, the highest in Maryland history for a Republican governor. This election could well test the old axiom in politics that claims “message trumps money,” because Chris Van Hollen has plenty of money and the proven ability to craft a compelling enough message, as demonstrated by his success 14 years ago, when he took on the “Kennedy Dynasty” in the Democratic primary for Congress in 2002. Donna Edwards would wish to replicate her 2008 effort, when she cobbled together a very impressive coalition of influential, progressive groups and community organizations, which translated into broad success on Election Day. Van Hollen is garnering 60% of the vote in Montgomery County, with 15% still undecided. Edwards has 68% of the vote in Prince George’s County, with 11% undecided. 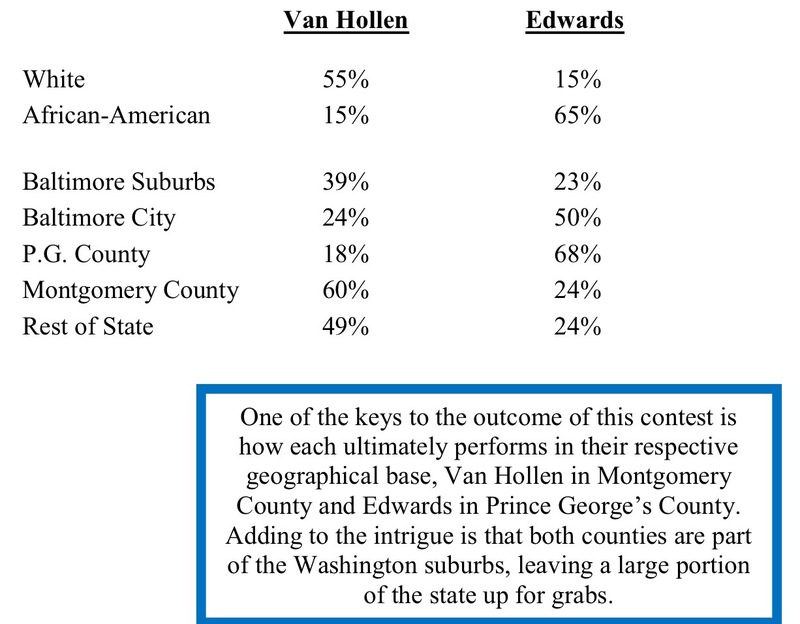 Van Hollen’s recognition and money advantage have propelled him to a 16 point lead in the Baltimore suburbs, and a 2-to-1 lead (49% to 24%) in the Eastern Shore/Southern MD and Western Maryland rural parts of the state. But, while the Baltimore suburbs, Eastern Shore/Southern MD, and Western Maryland regions comprise 21 of the 23 counties, they make up less than 50 percent of the vote in a Democratic primary. Edwards is up 50% to 24% in Baltimore City, suggesting resources her campaign has dedicated to messaging in the Baltimore media market are paying dividends there. There is a bit of gender partiality in play, with Van Hollen leading among men, 45% to 30%, and Edwards ahead with women, 40% to 33%. Come April this will work to Edwards’ advantage because women make up nearly sixty percent of the vote in a Democratic primary in Maryland. Van Hollen’s money-advantage and establishment-backing prove dispositive? Edwards’ grassroots strength and progressive group endorsements carry the day? The answer to these questions is what campaigns are for and why elections are held. This poll will be perceived as a positive for Edwards, although it would be even better if she were leading rather than narrowly trailing. My own sense is that Gonzales’ analysis somewhat overstates the strengths of the Edwards campaign. While we have yet to see the 2015 Q4 fundraising numbers, my belief is that those numbers will not only show Van Hollen with an enormous financial edge, they will show Edwards with so little money as to raise questions about her ability to pay staff and other campaign essentials from now until April 26. As I and others have noted, she is likely to entirely reliant on outside groups such as EMILY’s List for her TV and other media – I don’t see her as likely to be able to afford even direct mail on any significant scale, this being a statewide race. There is no historical precedent in any race of this magnitude – anywhere, not just Maryland – where a candidate wins with such massive reliance on IE spending to win. When all is said and done, this fact is likely to take a heavy toll on Edwards’ performance when the votes are ultimately cast. Clinton 40, Sanders 27, O’Malley 5. Sanders leads among white voters 43-25, but Clinton leads by 61-6 among black voters, with O’Malley drawing more support (8%) than Sanders. The General Assembly’s Workgroup on Public Safety and Policing Issued its recommendations yesterday, just in time for the start of the legislative session tomorrow. This Post article has a good summary of the situation and some reactions. RECOMMENDATION NO. 1: The LEOBR complaint filing deadline triggering the requirement that disciplinary action be undertaken by a law enforcement agency shall be extended from 90 days to a year and a day. RECOMMENDATION NO. 2: The requirement for notarization of a complaint alleging excessive force shall be eliminated, and replaced with a requirement that a complaint be signed by the complainant under the penalty of perjury. RECOMMENDATION NO. 3: The public complaint process in each jurisdiction shall be uniform throughout the State, streamlined, and publicized on department websites. A complainant shall be required to divulge their identity in a manner that is sufficient for a department to contact them and verify the legitimacy of the complaint. When there is a final disposition of a complaint, the complainant shall be informed of the outcome. RECOMMENDATION NO. 4: The time period for retaining an attorney for the internal investigation and disciplinary process under LEOBR shall be reduced from 10 days to 5 days. RECOMMENDATION NO. 5: As is the case in some jurisdictions, all law enforcement agencies in the State shall open their administrative LEOBR hearing board proceedings to the public. The General Assembly shall strike the statutory prohibition against citizen participation to allow a jurisdiction to permit a citizen who has received training in LEOBR to sit as a member of the administrative hearing board. RECOMMENDATION NO. 6: The law shall be changed to ensure that whistleblower protections are given to protect from retaliation officers who participate in investigations or who raise issues for investigation. RECOMMENDATION NO. 7: Each law enforcement agency shall require a use of force/incident report to be completed by the end of the shift unless the officer is disabled. RECOMMENDATION 8: Official department policies and collective bargaining agreements are public documents but are not easily available to the public. All department policies and collective bargaining agreements shall be available online. RECOMMENDATION NO. 9: The Department of Public Safety and Correctional Services is primarily responsible for the administration of State prisons and correctional services with few law enforcement trained personnel or sworn law enforcement officers in the Department. Law enforcement training and standards are significantly different from that of the State correctional system. An independent Maryland Police Training and Standards Commission (MPTSC) shall be established to focus solely on best practices, standards, and training in law enforcement and to create uniformity in policing practices across the State. RECOMMENDATION 10: The independent MPTSC shall include: representatives of State and local government; representatives of State and local law enforcement administrators; representatives of State and local law enforcement personnel; a representative of the Fraternal Order of Police; a representative of local State’s Attorneys; legislative members; members with expertise in community policing, policing standards, and mental health; and citizen members without relationships to law enforcement. RECOMMENDATION NO. 12: The MPTSC shall develop and require in-service anti-discrimination and use of force de-escalation training every other year for all law enforcement officers. RECOMMENDATION NO. 13 The MPTSC shall evaluate and modernize recruitment standards and practices to increase diversity in law enforcement departments and shall develop media strategies for recruiting women, African American, Latino, and other minority candidates. RECOMMENDATION 14:	The MPTSC shall develop a State certification that is transferrable between departments. RECOMMENDATION 15: The MPTSC shall develop and require annual reporting to the Commission by each department on the number of serious officer involved incidents, the number of officers disciplined, and the type of discipline that was administered. RECOMMENDATION 16: The Workgroup recommends that the MPTSC review the National Institute of Justice example use of force continuum and develop by regulation a set of best practices and standards for use of force. RECOMMENDATION 17: The MPTSC shall develop standards for mandated psychological evaluation after traumatic incidents and for law enforcement officers returning from combat deployment as well as periodic psychological evaluations for all officers as determined appropriate by the Commission. The MPTSC shall also amend the Code of Maryland Regulations to require that an applicant for police officer undergo a pre-employment psychological evaluation by a psychologist. RECOMMENDATION 18: The MPTSC, in consultation with DHMH, shall establish a confidential hotline that is available for law enforcement personnel to contact to speak to a trained peer law enforcement officer or a mental health professional who can assist with initial counseling advice and confidential referral to appropriate programs as needed. RECOMMENDATION 19: The MPTSC shall develop a Police Complaint Mediation Program in which certain non-violent complaints made against police officers are referred out of the standard complaint process and to voluntary mediation to be conducted by an independent mediation service. RECOMMENDATION 20: The MPTSC shall develop best practices for establishment and implementation of a Community Policing Program in each jurisdiction. Annually, each department shall file their community policing program with the MPTSC and the Commission shall review each program and offer comments to the jurisdiction. All community policing programs shall be posted online. RECOMMENDATION 21: State grants and funding shall be increased to provide matching funds for local jurisdictions to increase community law enforcement programs such as the Police Athletic Leagues (PALs), the Explorers Program, and similar recreational activities. The MPTSC and GOOCP shall also provide technical assistance to departments in applying for any federal, State or foundation grants available for these purposes. RECOMMENDATION 22: Incentives shall be provided by the State and local jurisdictions to encourage law enforcement officers to live in the communities in which they police, particularly in high crime, high poverty areas. These incentives shall include measures like take home patrol cars, property tax credits, renter’s tax credits, and State and local income tax deductions for officers who live in the jurisdiction in which they work. RECOMMENDATION 23: The LEOBR shall be amended to require that for use of force incidents, the trial board shall be composed of one member selected by the Chief or Sheriff, one member selected by the FOP/affected employee, and one member who is mutually agreed upon. The members must be selected from a pool of police officers who are not from the affected officer’s jurisdiction. One member must be of equal rank to the affected employee. A collective bargaining agreement may specify a different method of choosing a trial board. The coalition recognizes the positive votes today by the Maryland Public Safety and Policing Workgroup, which are an important start to allow for increased civilian participation in misconduct investigations, more transparency for the community and victims, and more robust training. We appreciate the time and effort put in by the workgroup. Nonetheless, there remain important areas that need improvement to ensure real accountability, especially in communities targeted by racially biased over-policing. Reforms that are still needed include lifting the restriction on who can file a police brutality complaint, lifting the restriction that only sworn law enforcement personnel may investigate complaints, and requiring that complainants identify themselves. In addition, we are concerned about a last-minute addition to the recommendations that would change the composition of the trial board to give the FOP a greater role in the discipline process. Sounds about right to me. The preliminaries are over – the heavy lifting starts tomorrow. Apparently, every Washington Post reporter has one name on their Rolodex when it comes time to write an article about Maryland politics. And it turns out to be Todd Eberly, our favorite know-nothing analyst, who always predicts doom for Democrats when they act like, well, Democrats. Today’s otherwise uneventful preview article finds the Post and Eberly warning Democratic legislators against, well, doing their jobs. A string of overrides could set a confrontational tone for the session. It also would send a clear message to Hogan, whose approval ratings soared last year as he battled cancer while continuing to govern. There’s a lot of moron packed into those two short paragraphs. Where to begin? “Confrontational tone”? Hogan’s a Republican, while 65% of the House and 70% of the Senate are Democrats. They stand for different things – confrontation is part of the deal in politics. Additionally, why warn Democrats against confrontation, when Hogan gave a highly “confrontational” State of the State speech a year ago? And then puzzled even his own party’s legislators by attempting to sabotage a budget that had been agreed to by all concerned? Next, is it the Post’s view that because Larry Hogan is personally popular, Democrats should just do what he wants? What other “clear message” might veto overrides carry with them? Next, Eberly’s nonsensical “we are Democrats first” comment. These are Democratic Party elected officials – how else would he like them to act? Like Republicans? There are some key issues embedded in those Hogan vetoes and the underlying bills. Asset seizure, criminal law changes regarding marijuana paraphernalia, voting rights for ex-felons. Eberly seems to be saying that legislators shouldn’t legislate in ways that Hogan disapproves of – why? Any difference between the various overrides, or is it just a general principle that Democrats aren’t supposed to be Democrats? What a load of horseshit. And finally, the “shot across the bow” nonsense. When national Republicans filibustered every bill for so many years, was that a shot across the bow? When Maryland Republicans use the filibuster in Annapolis, is that a shot across the bow? Don’t remember those arguments being made by the only known Maryland political analyst used by the media. So why is it a shot across the bow for Democrats, who have the requisite votes within their own party to override vetoes, to use an available means of legislative expression? I can’t really think of a good answer to any of my questions. And if the answer involves deferring to Hogan because he has cancer, you and I can’t be friends any more. Which you ought to know if you’ve been reading this blog for any significant amount of time. Personal courtesy and expressions of support are all well and good, but cancer is not a political bargaining chip to be traded upon. Politics is making real, hard choices about big issues, and no vote on policy – ever – should be made out of sympathy. 43,000 ex-felons shouldn’t have the question of their voting rights decided because Larry Hogan got sick. Which I really shouldn’t have to explain to a professor of political science. I’m done. A little too dizzy and out of breath for a mic drop but I feel better now. To the Washington Post – please do a Google search and find someone else to discuss Maryland politics. My future mental health thanks you in advance. 2015 was quite a year, huh? A year ago everyone knew that Barbara Mikulski and Stephanie Rawlings-Blake were both running for reelection, Freddie Gray was still alive, Jeb Bush was going to win the Republican nomination, Donald Trump was an eccentric businessman, and Bernie Sanders was a not very well known senator from Vermont. Not only that, but Maryland Scramble DIDN’T EVEN EXIST. Contemplate that, if you can. Now comes 2016. Gonna be “yuuuuuuuuuge.” 117 days to the MD primary, 105 days to early voting. More blogging, more excitement, more fun than ever. Promise. I hope your 2015 ended well, and your 2016 is even better. Happy New Year. 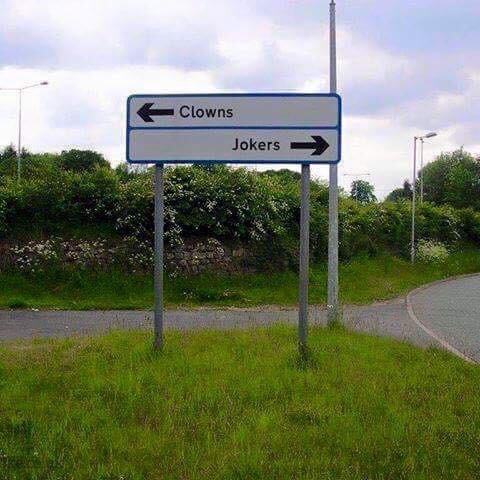 Stick around – the clowns and the jokers are just getting started. In 16 days, the General Assembly goes back to work. There will be many story lines, not least of which seeing how things go for the five officeholders who are running for Congress in CD4 and CD8. But the first order of business for the legislature will be the prospect of whether to override Governor Larry Hogan’s four vetoes. There are strategic considerations to discuss, and there is the not so far away anymore 2018 election to think about, but today I want to focus on one of the bills that Hogan vetoed, HB980, that would have restored voting rights to approximately 43,000 individuals with felony convictions when they get out of jail. Current law delays such voting rights until the individual completes parole or probation, a process which can take many years to complete. The lead sponsor of this bill is my friend Delegate Cory McCray of Baltimore. He has established a Facebook page, Marylanders for Voting Rights, which can be found here. A number of folks have done videos calling for the Hogan veto to be overridden. Here’s a few. Cory has developed a very nice map showing where the likely beneficiaries of this law reside. 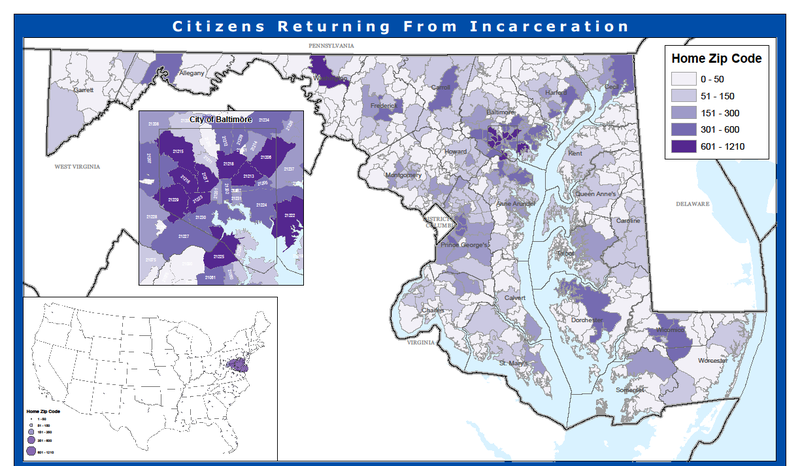 Baltimore City has by far the most citizens returning from felony incarceration. Big shocker, I know. I bet Larry Hogan knows that, too, wink, wink. The final vote on this bill in the House was 82-57. 85 votes (60%) are required to override a veto. 81 Democrats voted yes. Speaker Mike Busch needs to find four votes. One of those votes will almost assuredly come from new Delegate Susie Proctor, whose late husband Jim Proctor missed the vote last year. That leaves three votes. Delegate Michael Jackson of Prince George’s County did not vote on the bill last year. That could be a second vote. Busch then would need to find two votes from among the eight delegates listed below who voted no on the bill in 2015. Back in 2012, the Court of Appeals held that, contrary to what was actually happening, defendants had a right to counsel at bail hearings, including the initial determination by a commissioner. This was a bombshell ruling – in FY 2011, District Court commissioners conducted 176,523 initial appearance hearings, 30% of them in Baltimore City alone. The costs do providing counsel for all those hearings was and remains staggering. In response to that ruling, the General Assembly in 2013 set out to restructure the bail system in Maryland. Three legislative sessions later, no resolution has been reached. Why not? On the surface, it’s a dispute between the House of Delegates and the State Senate. The Senate had been in favor of more comprehensive reform, while the House supports more limited reform and at least some resistance to the court ruling. Now the issue appears largely dead. The bail bond industry has powerful allies in Annapolis, where many lawmakers are trial lawyers. Eliminating the system wholesale may not be politically possible, at least for now. But the idea should get fair consideration. Even if the state is compelled to hire scores of public defenders to ensure defendants’ constitutional rights, it can also make the system fairer and more sensible by providing non-monetary means of encouraging defendants to appear in court. As is so often the case, the Post overshot the mark by smearing every “trial lawyer” in the legislature, and there aren’t “many” such lawyers any longer, as the number comes down every election. But the Post isn’t wrong. There are impediments to real reform. Hint: one of the principal opponents of real bail reform in the legislature is no longer there, while a current legislator is now in a stronger position to advocate the industry’s interests than was the case when the editorial was published. Moving on . . .
OK, that was a super long intro, but here’s the point. Nothing is moving in the legislature any time soon. Tens of millions of dollars are being spent on ad hoc efforts to get lawyers to cover initial bail hearings. Racial and socioeconomic effects persist. Time for a new strategy. The rallying cry of the “trial lawyers”: to the courthouse! The lawsuit filed by the Equal Justice Under Law in San Francisco federal court in October seeks to abolish the cash bail system in the city, state — and the country. It’s the ninth lawsuit the center has filed in seven states. The center has settled four lawsuits, convincing smaller jails in states in the South to do away with cash bail requirements for most charges. Telfeyan said a win in California could add momentum to the center’s goal to rid the country of the cash bail system, which the lawyers say is used by most county jails in all 50 states. The federal system usually allows non-violent suspects free without bail pending trial and denies bail to serious and violent suspects. The bail bond industry ignored the suit originally, but has now jumped in after government lawyers in San Francisco responded with insufficient vigor to defend the bail bond industry’s profits. Sound familiar? But on Monday, lawyers for the California Bail Agents Association filed court papers seeking to formally oppose the San Francisco lawsuit. The association argues that government lawyers for San Francisco and the state are offering only “tepid” opposition to the California lawsuit. San Francisco Sheriff Ross Mirkarimi argues that most jail inmates are awaiting resolution of minor, non-violent crimes and that letting them free while awaiting court hearings will save the city millions of dollars. Mirkarimi said non-violent suspects can be monitored electronically and with frequent visits from law enforcement officials to ensure they don’t flee the area and attend all their court hearings. The for profit bail bond industry has outlived its usefulness, if it ever had any. It’s rife with corruption, it’s insufficiently regulated, and it perpetuates existing de facto discrimination in the court system. It’s time for it to go, and there are alternatives. A lawsuit in Maryland like the one in San Francisco would help to bring about real and necessary change. The only change that’s happened yet was started by such a lawsuit. Now it’s time to go for the home run ball. Who’s up for this? Memo to Fred Hiatt: Your increasing neocon sensibilities are affecting your reasoning processes (shockingly, the Justice Policy Institute analysis linked above notes the connection between the bail bond industry and ALEC, the right wing state legislative arm, creating alarming levels of cognitive dissonance for the Post, I’m sure). Dude, sometimes it’s those nasty “trial lawyers” that bring about the changes for good in this country, and I mean, y’know, Brown v. Board of Education and all that? Put the blame where it belongs: the bail bond industry. People who want to buy marijuana in Maryland for medicinal purposes are probably going to have to wait until 2017, nearly four years after the state made it legal. The Maryland Medical Cannabis Commission announced Monday that it will not award licenses to grow and process the drug until sometime in the summer — and industry officials say it will take an additional four to six months after that for the product to be ready to sell. The commission said it has no target date for allowing retail dispensaries to begin operating and cannot say when marijuana will be available to patients. Maryland’s medical cannabis program was approved by lawmakers in 2013, but it had to be adjusted multiple times before applications could be sought and submitted. The commission said this year that it would start issuing licenses in January but backed off that timetable last month after receiving more than 1,000 applications from would-be pot producers and dispensers. The unexpectedly high interest and the need to vet prospective businesses carefully is driving the delay, the commission said. Several interested growers have started buying land and leasing buildings for operations in Maryland so they can launch quickly if they are given licenses. Darrell Carrington, executive director of the Maryland Cannabis Industry Association, said that some prospective businesses may not be able to afford the waiting period but that those that are well planned and well funded should not be threatened.